Sodium is a naturally occurring mineral element which is used as a major ingredient worldwide. 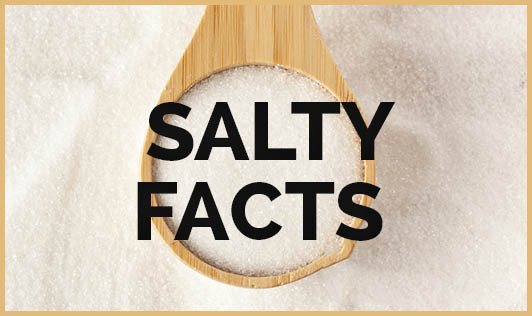 Much of the sodium we use is in the form of sodium chloride, which is better known as common table salt. Salt was probably the first food additive and seasoning agent used by man for taste and also flavors. Today, it is one of the most widely used additives and is second only to sugar in the amount added to food. For some individuals, more than the required quantity of sodium in the diet may contribute to high blood pressure or hypertension and less quantity may cause hypotension (low blood pressure). High blood pressure is a major risk factor for heart diseases, stroke and kidney disease. A high sodium diet or low sodium diet alone however does not cause variation in blood pressure. A combination of factors like family history, being overweight, race, physical fitness and lifestyle of an individual also contribute to blood pressure problems. The amount of sodium a person needs varies. Under normal conditions, a person may need as little as 500 milligrams of sodium or the amount of sodium in ¼ tsp of salt. In conditions such as excessive sweating, diarrhea and vomiting, sodium is lost, so the need for the mineral is greater. Any increased need for sodium can easily be met by diet alone since sodium content of the average diet is already greater than the amount normally required for maintenance. • Table salt and other seasoning: Sodium is often added to foods during preparation in the form of table salt, monosodium glutamate, sea salt, kala namak, rock salt etc. One level teaspoon of salt contains about 200mg of sodium. • Processed foods: Salt and Sodium containing additives are added to foods that are processed (ready to eat snacks like chips, salted nuts, and pappads etc.) and sodium containing additives play an essential role in preservation of food. E.g. Pickles, sauce and ketch ups etc. • Foods that naturally contain sodium: All foods that come from animals contain sodium naturally. Most fresh fruits and vegetables also contain some sodium, but in smaller amounts. • Medicines: Some over-the-counter drugs and medications contain sodium. Experts believe that, though cutting down on salt may not prevent high blood pressure; it may lower blood pressure for people who are considered to be "salt sensitive". Often a low salt diet, combined with weight loss, medication or some other course of action, controls high blood pressure effectively. Salt is tasty and an important ingredient in our daily cooking. Use them in limited quantity to stay healthy.